Unfortunately the school in Anlong Khong had to close due to water damage. More information can be found here. If you would like to volunteer at HPHAO or one of the partner organisations see contact for more information. "Improvement of the Quality of Life of Persons Living with HIV/Aids"
HPHAO has founded three childcare centres in communities in the surroundings of Phnom Penh. 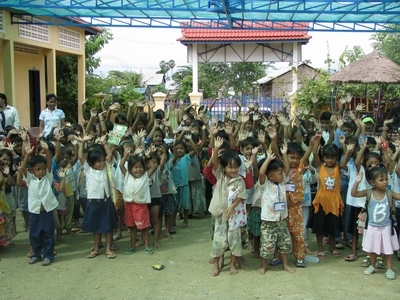 Ideally around 300 children receive daily education, two meals a day and care while their parents are working. In this way the children are prevented from wondering and begging on the streets. Despite of poverty and illness they are given a chance of a childhood and an education. Additionally HPHAO provides home based care to families. HPHAO is supporting families to cope with HIV/Aids and supplying necessary medications. If necessary they will be brought in contact with healthcare institutions. HPHAO is unique in being an organisation run mainly by Cambodians, several of them are infected with HIV/Aids and the organization has been successful in attracting a number of people who are HIV positive to work voluntarily on projects.